Pridon's Hearth is Sargava's newest colony, pushing the country's borders further south than ever before and attracting treasure-hunters, fortune-seekers, and troubled souls hoping for a fresh start. But unnaturally powerful storms rock the tiny settlement just as the local lizardfolk tribe declares war on the colonists within. Are these threats somehow related? What became of the heretical cult of Gozreh that journeyed to the region a century ago and do its corrupt teachings hold the key to calming the growing hurricane? Can the heroes protect the growing community from raging tempests and hostile monsters alike? And what role does the shadowy Aspis Consortium play in these recent dangers? These challenges and more await heroes willing to face down the Ire of the Storm! Designed for use with Pathfinder Roleplaying Game, this adventure is packed with excitement and unique personalities. 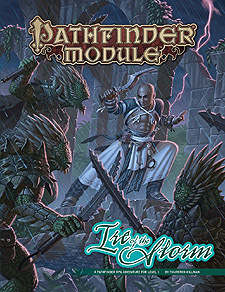 Written by rising star Thurston Hillman, Ire of the Storm is a deluxe adventure for 1st-level characters, and includes 64 action-packed pages of tropical dangers, jungle ruins, and two new monstrous foes, plus a gorgeous double-sided poster map featuring the Sargavan colony of Pridon's Heath and an exploration map providing an overview of the entire surrounding region. Players can expect to reach 6th level upon completion of this adventure - or wind up food for all manner of scaly menaces!